The Challenger: Creighton. Creighton is the second best team in the Big East, but they have had no problem picking apart the Wildcats in both of their meetings. The Bluejays won both games against Villanova in convincing blowout fashion. Jay Wright has said that Creighton just is a bad matchup for the Wildcats, they force the Wildcats to do something defensively that just doesn’t make them comfortable. 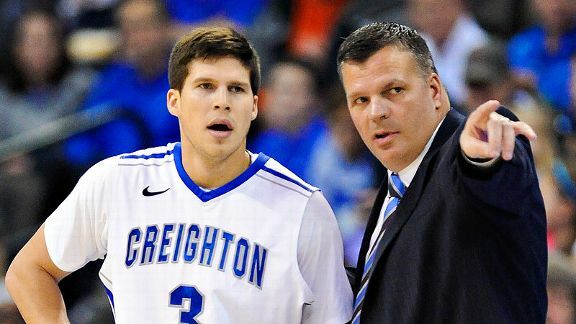 Creighton is a team filled with sharpshooters led by Doug McDermott. McDermott eclipsed the 3,000 career point mark in Saturday’s game against Providence. The National Player of the Year candidate scored 45 points in the rebound win. The Bluejays ran into a setback towards the end of the season when they lost back-to-back games against Xavier and Georgetown before winning their season finale. They live and die by the three, opposing teams definitely do not want to give them an opportunity to heat up from the perimeter. Four Bluejays landed in the top 10 for the highest three point shooting percentage in the Big East. The Contender(s): Providence (and possibly Xavier). Providence has one of the best players in the conference in Bryce Cotton. Cotton would make a strong case for Big East Player of the Year if it weren’t for someone named Doug McDermott. The Friars started heating up at the tail end of the season until they were halted by Creighton. Sure they will not have the magic of the Dunkin Donuts Center, but they do have a pretty solid core of players. They can be a little inconsistent at times, but when they can find a rhythm, they can be problematic. One drawback for the Friars is that they do not really have depth, and that can take its toll the further they go into the tournament. Xavier is listed here, but I think the difference maker in the tournament for them is not with Semaj Christon, (although he is a HUGE part of their team) but Matt Stainbrook. Stainbrook strained his MCL against Seton Hall and has not played since. Stainbrook has been rehabbing his left knee to try to get back in time for the tournament. His status remained unknown until last night. Xavier announced that the 6’10” center would be ruled out for at least the quarterfinal matchup against Marquette. The Musketeers will need him if they want to be able to go far into the tournament. Christon is one of the best in the conference, being one of the few to be named unanimously to the All-Big East First Team. The Musketeers need Stainbrook’s replacement, freshman Jalen Reynolds, to step up. They need him especially to compete with the domineering size Marquette will have waiting for them. The Dark Horse: St. John’s. I honestly don’t think the Red Storm has received enough credit this year when it comes to playing at home. Madison Square Garden is technically their home court, and they’ve played pretty well there all season long. It’s not the level of Providence and the Dunkin Donuts Center, but it’s up there. St. John’s is 14-4 at the Garden this season. Their four losses come to Syracuse, Xavier, Villanova, and Providence. In the games against Syracuse and Villanova, they kept it closer than the score suggested and they played hard against those teams. Unfortunately for the Red Storm, their defense couldn’t hold and gave up a late run that doomed them. St. John’s just couldn’t keep up at the end. They have talent in D’Angelo Harrison and a rising star in Rysheed Jordan. They also have hardnosed players in the paint that have good size and length. They may have cooled off a bit at the end, but Red Storm will be a challenge for their opponents. Look for them to possibly shock some Big East fans. The X-Factor: Bench Play. In tournaments like these where there are a number of games played over the span of a few games, the bench is important. Teams that have great depth and reserves who can contribute quality minutes tend to go deeper into the tournament than those who do not. Teams that are looking to go farther in the tournament better have a bench that is ready to play well and step in as starters get a break. Villanova, Marquette, and Creighton have greater depth and receive good minutes from their reserves than others in the conference. Master Strategist: Jay Wright (Villanova). Jay Wright has taken this team to new heights this season. They have proved many doubters and naysayers wrong over the course of the year. Wright has a big role in this team’s success so far this season and is in the running for Big East Coach of the Year. He has led the Wildcats to their first Big East outright regular season title since the 1981-1982 season and is looking to achieve more. The 28 wins that Villanova has picked up this season are the most in program history. One of the big storylines entering this tournament and one of the very few questions he has left unanswered so far is, will he be able to figure out Creighton? Outlook: This tournament is looking like it will have Villanova and Creighton on a crash course in the finals. Along the way there will be teams that are on the bubble for the NCAA tournament and will look to provide a challenge, but will they have enough to crash the party? The first opening round game is a rematch of a recent game between Butler and Seton Hall that took place last Saturday. Butler has beaten Seton Hall in both meetings so far. it should be interesting to see if Seton Hall will be able to break on through. From there, Villanova should easily advance to the semis where they face the winner of Providence and St. John’s. I would rather face Providence than St. John’s in the semis. Providence does not have depth, and St. John’s has been knocking on the door every time the Wildcats played them. The first time at the Garden, it took a late run deep in the second half that got us just enough separation for it to hold until the final buzzer. The previous game was at the Wells Fargo Center, where they came way too close for comfort. The game was not decided until the closing seconds of the second half. St. John’s has a little of everything, talent, size, and depth. The Wildcats should be able to take care of Providence easily, but St. John’s worries me a little bit. Eight of Providence’s eleven losses this season came when they played at places that weren’t named the Dunkin Donuts Center. St. John’s is definitely beatable but they won’t make it easy. As for the other side of the bracket, Creighton will most likely advance to at least the semis. However, if Georgetown defeats DePaul and faces Creighton in the quarterfinals, it will be interesting to see what happens. The last time these two teams played, Georgetown’s swarming defense dismantled Creighton. If Georgetown comes out playing as well or better than they did on that night, Creighton may have a problem. Xavier’s trip to New York is looking like a one day affair with the absence of Stainbrook. Xavier has not won since he went down. Marquette is one of the more bigger, physical teams in the conference, they need all the size they can get to counteract Marquette’s big men. With Stainbrook gone, they will take advantage of the paint. It is also worth noting that Marquette has become a little less one-dimensional in that they have been establishing a bit of a perimeter game. Lately, Todd Mayo and Jake Thomas have been doing a good job of taking some of the load off of Davante Gardner. As for the finals, unless if both teams have a bad night or get caught looking ahead, Villanova and Creighton will meet for a third time. However for Villanova’s sake, I hope that is not the case and that Creighton gets knocked out before the finals. I see that being a possibility more so for Creighton, than I do for Villanova. As much as it hurts to say it and as much as I hate, hate, hate, to say this… Creighton will beat Villanova a third time if they meet again. People say that beating a team three times in one season is simply too difficult. While this may have proven true in other instances, it will not be true here. I looked forward to the second meeting between Villanova and Creighton, thinking that the first meeting was a fluke and during the time in-between there would be a new gameplan that would stop them. Unfortunately, the result was more of the same. In fact, it was probably worse, Creighton blew out Villanova and did so with a much higher shooting percentage than the first time. There just was no promise or evidence that things were going to be different, it took a turn for the worse. Granted, the officiating was not helping either, but Creighton for the most part has Villanova’s number. It was never close, they beat Villanova in back-to-back blowouts. I really hope the Wildcats prove me wrong, I will be rooting for them every step of the way. I’ve heard and had enough of Doug McDermott. They are the Kryptonite to our Superman. We’ll beat every other team, but Creighton is that nagging pain that just won’t go away. I would be shocked if it is another blowout. However, if I had to pick one team that would be knocked off before the finals between Villanova and Creighton, I would pick Creighton. Not because I’m hoping they just don’t play Villanova, but they seem more prone to be defeated by the other teams in their side of the bracket. If Creighton does get knocked off and the Wildcats make it to the finals, Villanova is a sure bet to cut down the nets and punch their ticket as a #1 seed.